In a 4-year lysimeter experiment, we investigated the effects of topsoil heavy metal pollution (3,000 mg kg−1 Zn, 640 mg kg−1 Cu, 90 mg kg−1 Pb and 10 mg kg−1 Cd) and (synthetic) acid rain (pH 3.5) on tree growth and water use efficiency of young forest ecosystems consisting of Norway spruce (Picea abies), willow (Salix viminalis), poplar (Populus tremula) and birch (Betula pendula) trees and a variety of understorey plants. The treatments were applied in a Latin square factorial design (contaminated vs uncontaminated topsoil, acidified rain vs ambient rain) to 16 open-top chambers, with 4 replicates each. Each open-top chamber contained two lysimeters, one with a calcareous, and the other with acidic subsoil. The four tree species responded quite differently to heavy metal pollution and type of subsoil. The fine root mass, which was only sampled at the end of the experiment in 2003, was significantly reduced by heavy metal pollution in P. abies, P. tremula and B. pendula, but not in S. viminalis. The metal treatment responses of above-ground biomass and leaf area varied between years. In 2002, the heavy metal treatment reduced above-ground biomass and leaf area in P. tremula, but not in the other species. In 2003, metals did not reduce above-ground growth in P. tremula, but did so in the other species. 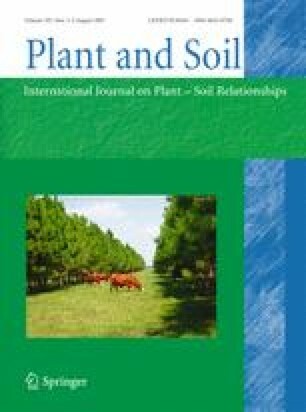 It appears that the responses in above-ground biomass and leaf area, which paralleled each other, were related to changes in the relative competitive strength of the various species in the two experimental years. S. viminalis gained relative to P. tremula in absence of metal stress, in particular on calcareous subsoil, while P. abies showed the largest increases in growth rates in all treatments. Above- and below-ground growth was strongly inhibited by acidic subsoil in S. viminalis and to a lesser degree also in P. abies. In P. abies, this subsoil effect was enhanced by metal stress. Acid rain was not found to have any substantial effect. Whole-system water use efficiency was reduced by metal stress and higher on calcareous than on acidic subsoil. Responsible Editor: Fangjie J. Zhao. We thank Werner Attinger, Joerg Luster, Michael Lautenschläger, Peter Bleuler and Martin Keller for their valuable help with the operation of the lysimeters, soil water measurements, plant sampling and biometric sample analyses. Financial support was obtained by the Swiss National Science Foundation.